WTI crude prices are $50.50/b this morning. (It is rare to see such an even number. Does this indicate that there is a 50:50 chance prices will go up or down? Usually a safe bet!) 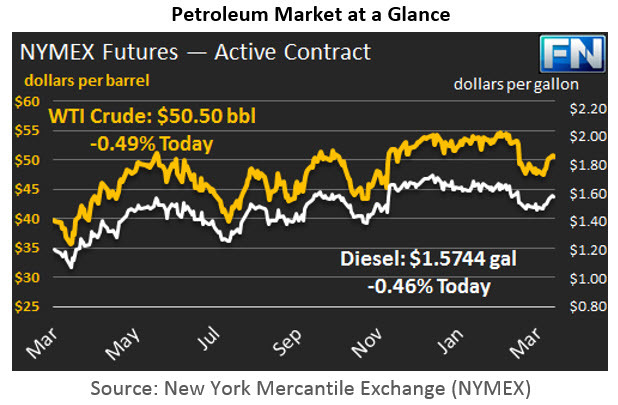 The price rally waned yesterday, though prices stabilized above $50/b. WTI opened at $50.24/b today, a drop of $0.45 below yesterday’s opening. 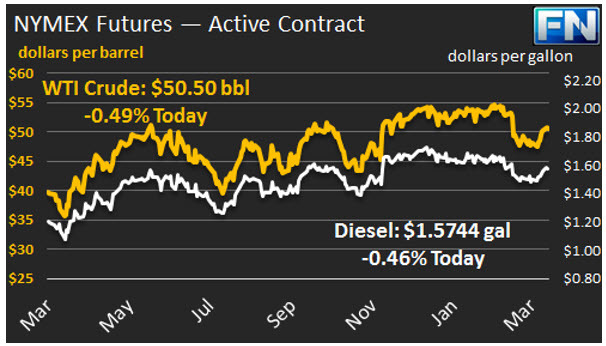 Early morning interest has brought prices up to $50.50/b, $0.26 above yesterday’s close. Product prices showed a similar pattern: a rally yesterday, ebbing prices in the afternoon, and early morning buying today causing prices to rise once again. Diesel opened at $1.5634/gallon in today’s session. This was a decline of 0.95 cents (0.6%) below yesterday’s opening price. Current prices are $1.5744/gallon, up 1.1 cents from yesterday’s close. Gasoline opened at $1.695/gallon today, a decline of 0.57 cents, or 0.34%, from yesterday’s opening. Prices are $1.701/gallon currently, up 0.73 cents from yesterday’s close. Prices had been strengthening in part because of renewed militia activity in Libya, which blocked a pipeline leading from the Sharara oil field in western Libya to the Zawiya export terminal west of Tripoli. Approximately 220 kbpd of crude was taken off the market since Monday of last week. Libya’s National Oil Corporation lifted force majeure on crude loadings yesterday, and prices subsided. Countering this, however, is the possibility of disruptions in Iraq, where tensions have risen in the Kirkuk producing region. On the domestic front, Schneider Electric’s survey reveals that the industry expects a stock drawdown to be announced this week. The EIA has released its data on U.S. Retail Gasoline and Diesel Prices for the week ended April 3rd. Prices rose for both fuels at the national level, following crude prices up. Gasoline prices jumped 4.5 cents/gallon, while diesel prices rose by 2.4 cents/gallon. Details are presented in our second article today.